PEKATEX® ART – an innovation for the innovative designer: light, stable in form, for pictorial and sculptural manifestation inside and outside. 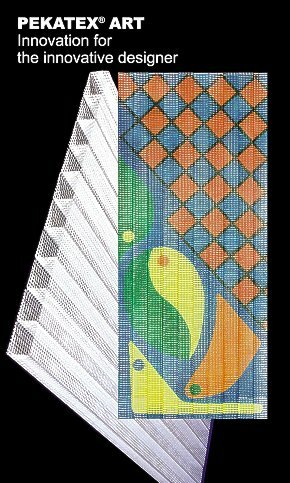 PEKATEX® ART establishes new standards two in one: Two light, netlike textile surfaces made of a high quality, sealed glass filament structure combine to one stable sheet. The standard PEKATEX® ART measures 30 mm in thickness and 64 cm by 117.5 cm in size (= 0.75 m2), weighing only 900 grams (1,200 grams per square metre). Variations of thickness and length can also be supplied upon enquiry. PEKATEX® ART offers itself for the creative design and it will accept a range of commercially available paints on one or on both sides. Knifing glaze, fillers or similar pasty matter find an excellent permanent grip in PEKATEX® ART. PEKATEX® ART will retain its form and will not require any special framing before, during or after the execution of decorative or artistic work. Sculptures can be created with PEKATEX® ART merely by cutting, staggered joining, through compilation of different layers or in combination with other components. PEKATEX® Skeleton Profiles of the same material can be provided for joining PEKATEX® ART sheets. The netlike, hollow body structure of PEKATEX® ART will allow a variety of amazing effects by the insertion of reflecting or lighting means for instance, perhaps enhanced by generating sprinkling or smoke in addition. The structure of PEKATEX® ART will comfortably reduce or absorb the effects of striking wind (draught) and noise, drumming rain, light glaze or undesired insight. PEKATEX® ART for pictures, collages, decorations, transparencies and sceneries; PEKATEX® ART for sculptures, columns, models and interior designs; PEKATEX® ART protects against wind, noise, rain, sun and undesired insight.